The land behind Barmouth which became the first donation to the National Trust. Dinas Oleu - "Fortress of Light"
Mrs Fanny Talbot said "I have long wanted to secure for the public for ever the enjoyment of Dinas Oleu, but wish to put it to the custody of some society that will never vulgarise it, or prevent wild nature from having its way. I have no objection to grassy paths or stone seats in proper places but I wish to avoid the abomination of asphalt paths and the cast-iron seats of serpent design which disfigure so largely our public parks, and it appears to me that your association has been born in the nick of time." Octavia Hill, one of the most influential social reformers of the 19th century, when forming the Trust spoke of creating "open-air sitting rooms for city-dwellers to have a place to breathe". 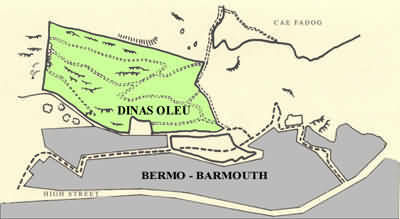 Dinas Oleu - translated means "Fortress of Light" - is a gorse covered hillside with small areas of young sycamore and oak. On its more open areas, warm breezes provide the ideal habitats for plants such as Sea Storks-Bill and Knotted Clover. Some rare liverworts and mosses have been recorded on the thin, well-drained soils. Cae Fadog, adjoining Dinas Oleu, is dominated by heath, and the scarcity of lowland heath gives it a special importance. Plants found here include Birdsfoot Trefoil and Wild Thyme. The frequency of flowering herbs is an important feature, providing good nectar for insects such as Solitary Bees and Hoverflies. The Linnet and the Meadow Pipit have been seen nesting on the site, and the Chough and the Peregrine Falcon have been seen flying overhead. The Mawddach Estuary and surrounding countryside were clearly an inspiration to Mrs Talbot and Canon Rawnsley. The poem alongside was written by Canon Rawnsley and is engraved into a rock on the mountainside above Barmouth harbour, overlooking the swirling waters and shifting sands of the mouth of the Mawddach Estuary, and often bathed in light from a magnificent setting sun.